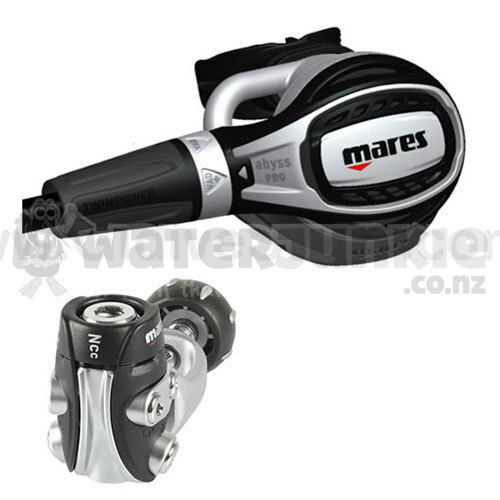 The regulator features Mares patented DFC (Dynamic Flow Control) technology, greatly enhancing regulator sensitivity and minimising inhalation resistance. The design consists of an all-metal nickel and chrome plated brass first and second stage, and provides excellent air flow which is enhanced by new VAD/VAD+ technology. The VAD flow control is located at the junction between the hose and the second stage. The flow control works like a motorcycle throttle and has two positions, VAD and VAD+. In the VAD position, Fusion 52X delivers breathing gas in a very smooth and natural way. The VAD+ position on the other hand anticipates your demand and provides a touch more flow than requested, resulting in a slight overpressure in the mouthpiece area. This Mares exclusivity allows the regulator to modulate the flow without affecting the cracking effort. It’s like having two regulators in one! Thanks to the improvements on the patented Vortex-Assisted-Design (VAD) system and bypass geometry, the Fusion 52X regulator establishes a new standard in breathing comfort. The two airflow settings allow for very natural and effortless breathing on the one hand and provide an additional airflow boost under strenuous situations and in more demanding conditions on the other. The toggle switch is integrated into the design of the second stage and is intuitive and secure in operation. With its all-metal case, the large membrane and the innovative design of the purge button, the Fusion 52X is a universal regulator for all diving conditions. The design of the Fusion 52X scuba regulator merges technical innovation with intelligent construction into a highly reliable piece of diving equipment.